Amazon.com still has one of the lowest prices on the Kinect Sensor with Kinect Adventures. Their Cyber Monday pricing is still at $99.99 with FREE Amazon Prime shipping. 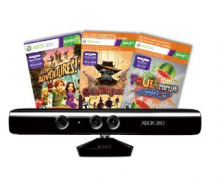 Head over to Amazon.com to check out this Kinect deal! If you haven’t bought yours yet, I’d grab one now. I’m betting the price will go back to $149.99 very soon! Amazon.com Cyber Monday Deals are LIVE!